As we observe with awe God’s creation of a perfect blossom unfolding its petals, glistening with dewdrops to the first golden rays of the sun, we behold the miracle of creation and open ourselves to the belief that with God’s power anything is possible. 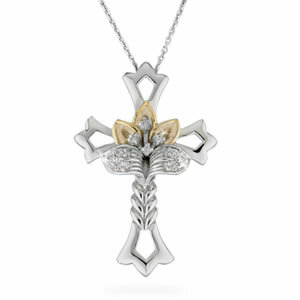 This gloriously sculpted cross pendant, by Master Jeweler Thomas Sota, features delicate White Topaz set stamens upon 14K Gold plated petals and sparkling White Topaz “dew drops” on the leaves. A constant reminder of your faith in Heaven’s promise of love and hope. A complimentary 18” chain is included.